Provide opportunity and equity for those most in need. Promote education, socio-economic well-being, environmental awareness and health improvement for everyone. Contribute to the creation of peaceful and productive communities, not only in the United States, but also in other countries. Guided by the teachings in the Bible and inspired by the passionate love and concern of Bro. Felix Y. Manalo, the Last Messenger of God in These Last Days, to the the spiritual well-being and general welfare of each member of the Iglesia ni Cristo (Church of Christ), the late Brother Eraño G. Manalo upheld the doctrine of brotherly love by leading the brethren to extend help, do good, and share with those who are in need, Church members and non-members, alike. Anchored on such faith, the Iglesia Ni Cristo (Church of Christ) commenced the “Lingap sa Mamamayan” (Aid To Humanity) Program. The program aims to provide relief goods, health care, and other services to the needy, especially those who are afflicted by calamities and disasters. The coverage of human and social welfare programs were even expanded to include seminars for disaster preparedness, first aid, and family planning. 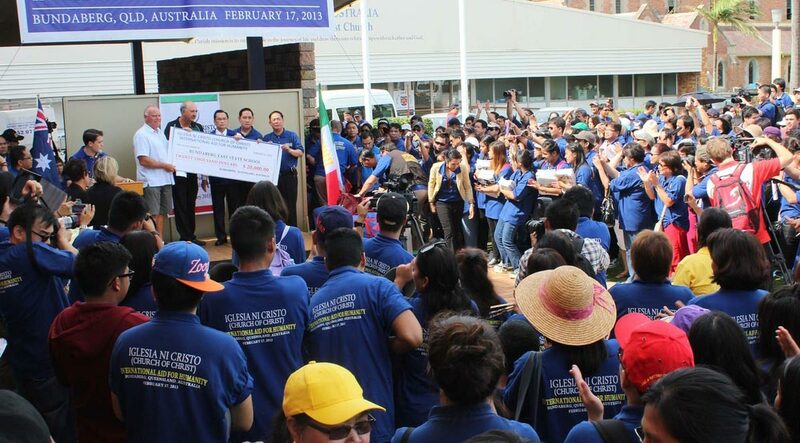 Other humanitarian activities such as blood donation and community clean up drives were also conducted in different parts of the world where the Iglesia Ni Cristo is established. 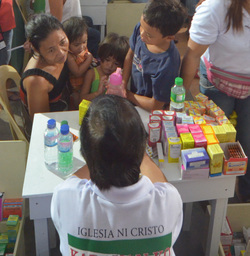 The immense growth of the human and social welfare programs, and the intense desire of the current Executive Minister of the Iglesia Ni Cristo (Church of Christ), Brother Eduardo V. Manalo, to help the brethren and the people in need, lead to the birth of another humanitarian institution, the “Felix Y. Manalo Foundation,” or better known as the “FYM Foundation,” which was formally registered in the Philippines on the 4th of February 2011, and in the United States on the 17th of May 2012. 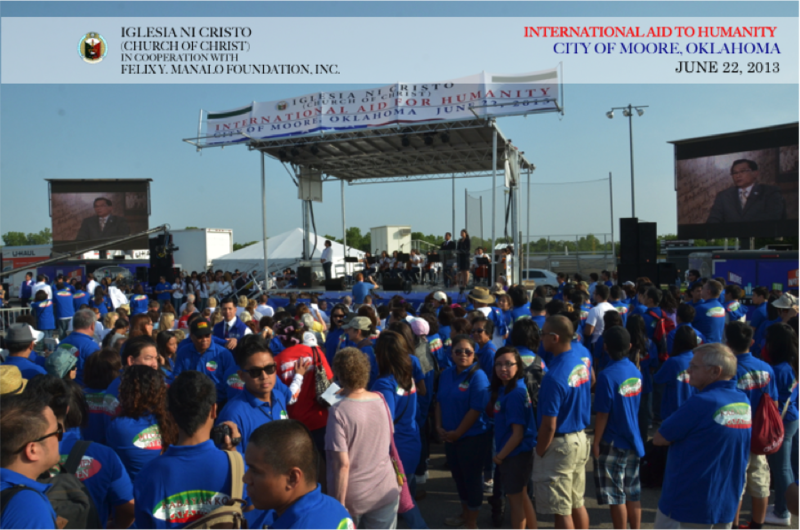 From its establishment, the FYM Foundation has been a strong partner of the Iglesia Ni Cristo in helping people not only within the Philippines, but also in other parts of the world such as the United States of America, Japan, South Korea, Spain, and Russia, where the FYM Foundation is officially recognized. The FYM Foundation also extends its aid and services to the needy in countries such as the United Kingdom, France, Japan, and Australia. The Felix Y. Manalo Foundation envisions being one of the leading charitable institutions in the world by providing services for people to lead healthy and productive lives, and promoting community development. As long as there are people in need, the FYM Foundation will continue to fulfill its pledge of extending help through aid and services, promoting education, socio-economic well being, environmental awareness, and health improvement. In May 2013, two EF5 Tornadoes struck and devastated Moore and El Reno, Oklahoma, USA. Upon hearing this unfortunate news, The FYM Foundation, being the charitable arm of the Iglesia Ni Cristo (Church of Christ), was instructed by the current Executive Minister of the Church, Brother Eduardo V. Manalo, to provide immediate relief to the victims of the said tornadoes. On the 22nd of June 2013, at West Moore High School, the FYM Foundation donated at least two thousand (2,000) relief bags to the victims still residing in the area; as well as donated a total of three hundred seventy-five (375) “Apple iPad 2’s” which were distributed evenly to the following schools: Briarwood Elementary School, Plaza Towers School, and Highland East Junior High School. In addition, sixty thousand dollars ($60,000.00) was donated to the Office of The Governor, Oklahoma, and another one hundred fifty thousand dollars ($150,000.00) to the City of Moore, in order to aid in the city’s recovery. On April 13, 2013, a day after the 50th year of passing of Bro. Felix Y. Manalo, his legacy lived on and inspired the present Church Administration and the Church members to uphold the doctrine of sharing and giving to those who are poverty-stricken and in need. Kabayon Ko, Kapatid Ko (My Countrymen, My Brethren), a welfare project spearheaded by the Executive Minister Bro. Eduardo V. Manalo, was conducted in Pasay City, Philippines where an estimated 300,000 people, members and non-members alike, flocked and received free medical and dental assistance as well as bags filled with various relief items. On the 17th of February 2013 the Felix Y. Manalo Foundation, Inc. provided immediate relief to the victims of Cyclone Oswald in Bundaberg, Queensland, Australia. The FYM Foundation donated twenty thousand dollars ($20,000.00) to Bundaberg East State School, North Bundaberg State School, and the Office of The Mayor For The Victims of Cyclone Oswald, respectively. Members of the Iglesia ni Cristo (Church of Christ) from the nearby areas volunteered and joined the FYM Foundation in helping the neighborhood in cleaning the flood-stricken houses and streets while bags filled with relief items were freely handed out to the victims. In response to Hurricane Sandy, the Felix Y. Manalo Foundation, Inc. conducted an ”International Aid For Humanity” program on the 20th of November 2012 in Times Square, New York, USA. There, the foundation was able to provide “relief bags” to the victims of the disaster, as well as donate twenty-five thousand dollars ($25,000.00) each to Coney Island and Bellevue Hospital. In addition, the New York Fire Deparment (FDNY Foundation, Inc.) and New York Police Department (NYPD Foundation, Inc.) each received a generous fifty thousand dollars ($50,000.00) from the FYM Foundation.